It is often said of the British suffrage movement that it was a cause fought by the middle classes, for the middle-classes – a narrative that was further cemented by the 1918 Representation of the People Act’s failure to enfranchise those women who did not own property. 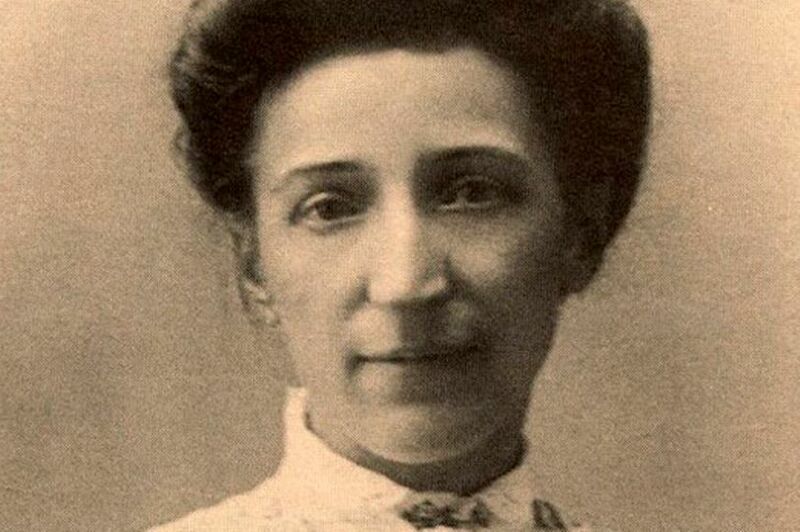 In the vein of those attempting to highlight the contribution of working women, and while we’re in the centenary year of the passing of such important, if to modern eyes flawed, legislation, I feel it is prudent to shed light on one working-class Manchester-based woman in particular. The information and quotes below are taken from the writer’s autobiography, The Hard Way Up (Faber and Faber, 1968). Suffragette Hannah Mitchell (née Webster) was born into a poor family on a Derbyshire farm in 1872. Upon running away from home at the age of 14, to escape from her mother’s cruelty and in search of a better life, Hannah moved to Bolton where she became a dressmaker. Once free of the domestic chores of her childhood, she highly valued the one day off a week she had on a Sunday when she would work hard to improve her reading and handwriting. Like most workers though she abhorred the long hours that shop work brought. She was introduced into politics through working-class demands for shorter working hours, attending various meetings agitating for reform and becoming an avid reader of the socialist organ The Clarion. It was through her early involvement with the Socialist movement that she met her future husband, Gibbon Mitchell, and moved with him to Ashton-under-Lyne. Hannah found, upon marriage, that not only did she have to give up her job, but that she also lost the leisure time she had previously enjoyed to domestic drudgery once again: ‘I soon found that a lot of the Socialist talk about freedom was only talk and these Socialist young men expected Sunday dinners and huge teas with home-made cakes, potted meat and pies, exactly like their reactionary fellows’. In addition to her independence being lost, the couple were financially worse off upon marriage, particularly once they had a child. Hannah was forced to take in extra needlework at home to make ends meet, and fit this around the childcare and housework that was solely left to her to complete. Through her attendance and involvement at local Independent Labour Party (ILP) meetings, she gradually became a well-known speaker, and became acquainted with those who would later become major figures in the suffrage movement such as Emmeline and Christabel Pankhurst. She joined the newly formed Women’s Social and Political Union (WSPU) and thus became a Suffragette during their early campaigning years, even serving a minor stint in Strangeways for interrupting a political meeting. Tales such as these are commonplace among Suffragette memoirs that the reader can easily become desensitised to the sacrifices made by the militant activists. However, Hannah’s blunt description of the heckling and physical attacks she faced during her attempts to campaign, coupled with her admittance that ‘no cause can be won between dinner and tea, and most of us who were married had to work with one hand tied behind us’, provides a very stark picture of the difficulties working-class women in particular faced in the fight to gain their right to vote. Even the description she gives of her husband paying her prison fine against her wishes so that she could continue her domestic duties at home is a sad reminder that not all of those who took part in the suffrage movement had the luxury of time, money or support at home on their side. Hannah’s membership with the WSPU ended after she suffered a nervous breakdown due to overwork and malnourishment. Unable to carry out the acts of militancy that were becoming ever more intense, and upset by the lack of support offered to her from the Pankhurst family during her illness, she instead joined the Women’s Freedom League (WFL), an organisation who had splintered from the main WSPU group over the use of violence within the movement. Hannah continued to campaign, albeit in less dramatic ways, up until the First World War, at the end of which the Representation of the People Act was passed. She continued her work in politics throughout the 1920s and 1930s, firstly being elected to Manchester City Council in 1924 and serving for four terms until 1935, and secondly serving as a magistrate from 1926 until 1937. Her experience of running a household on such a small income proved useful in these years as she provided much relief and a sympathetic ear to the poor, defending their needs in small but important ways. For example, she was instrumental in ensuring a public wash-house was built in her ward to help the local housewives have access to hot water and hot-air dryers, reducing the amount of time they would spend at home doing the laundry and with much better results. It is in these personal victories that she gained for the women of Manchester that you can really feel her pride emanating from the pages of her autobiography and why the achievements of ordinary working women should not be overlooked, no matter how small, as the struggle behind them is often felt the hardest. For all of her life she longed to be a writer, and achieved her dream posthumously when The Hard Way Up was published with help from her grandson, Geoffrey Mitchell, after he discovered the manuscript upon her death. This text is an invaluable source for social historians, giving insight into a way of working-class life in the late-nineteenth and early-twentieth centuries largely unrecorded in written form. Lack of other such memoirs is largely down to the scanty education that those from poorer families received in the Victorian era, even after the 1870 Education Act, and education is certainly a strong, recurring theme throughout Hannah’s life (and book). Her annoyance at being prevented from attending school due to domestic duties, and her disdain at being ‘forced to darn my brothers’ stockings while they read or played cards’, are the driving forces behind her future political activities and feminist ideology. Despite the vote being won for (almost all) women 100 years ago, the inequalities faced by Hannah Mitchell at home and in public are still depressingly similar to the struggles faced by women today. The Suffragettes may now be confined to history, but the attitudes that drove them to adopt their motto ‘Deeds Not Words’ still prevail, making The Hard Way Up a surprisingly modern read. Hopefully the work carried out by Hannah and her contemporaries have made the path to equality easier for twenty-first-century women to tread, with the result that some other ‘ordinary’ woman’s autobiography published in the next century will talk of further improvements still. Photograph via Manchester Evening News.